Buying gifts for kids is hard. When a celebration rolls around that requires a gift, I feel a mix of emotions. I want the gift to be exciting for the little one receiving it… but I also want it to get used. It can be tricky finding a toy or game that does both. 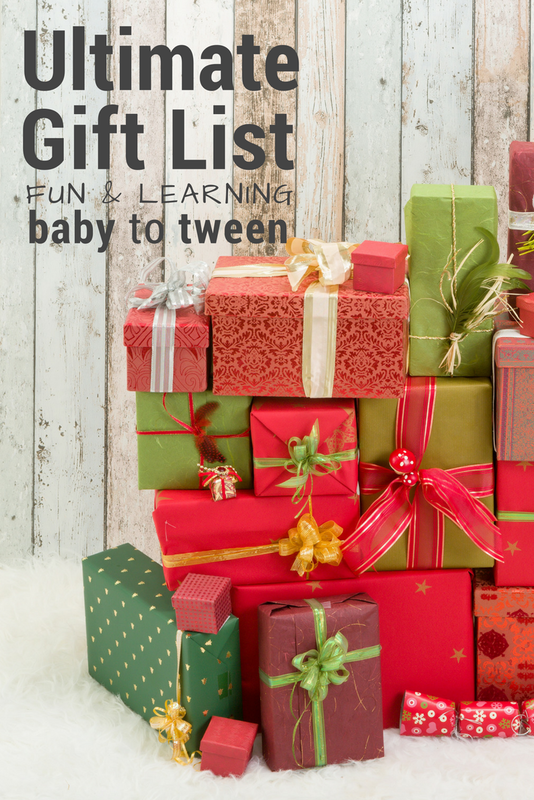 For this HUGE list of gifts, I looked for toys and games with an initial wow factor, as well as longevity and just for fun I tried to make sure they had an element of learning too. I’ve included links to the recommended products where it was possible. Those links are affiliate links which means when you purchase from them I will receive compensation. Thanks! You’ll notice one educational toy made it onto almost every list and I whole heartily agree. A nice set of wooden blocks can be used for so long and used in so many ways… it’s an investment you won’t be sorry you made! Our set came from Lakeshore Learning but there are a lot of other choices out there. 16 Educational Toys and Games for Kids Ages 0-2. Attentive parents and family members, good old quality time, and cuddles. Paint swatches from a home store. They are a great tool to start introducing colors, matching, patterns, counting etc. And they are free! A collection of different sized cardboard boxes hopefully one big enough to climb inside. Anything in the treasure basket – household items, natural materials, unusual textures. Red (pinto) beans after the “put everything in your mouth” stage is over. Washable Crayons on different surfaces. A baby gym with foam play blocks and challenges, crawlers get pleasure from mastering challenges. Small objects and a container with a hole in it. 24 Educational Toys and Games for Kids Ages 3-5. Hot Wheels …great for hands-on counting, addition, subtraction, division, social concepts. A Kitchen Stool so they can help with cooking! Kid Size Table and Chairs. YES! YES! YES! We’ve always had one, now our creative table is a little bigger though. Anything related to their current interests. Safari Ltd Zoo Animals These are great for play dough, playing in the sandpit, in the bath, sorting, counting, memory games and imaginative play, of course! 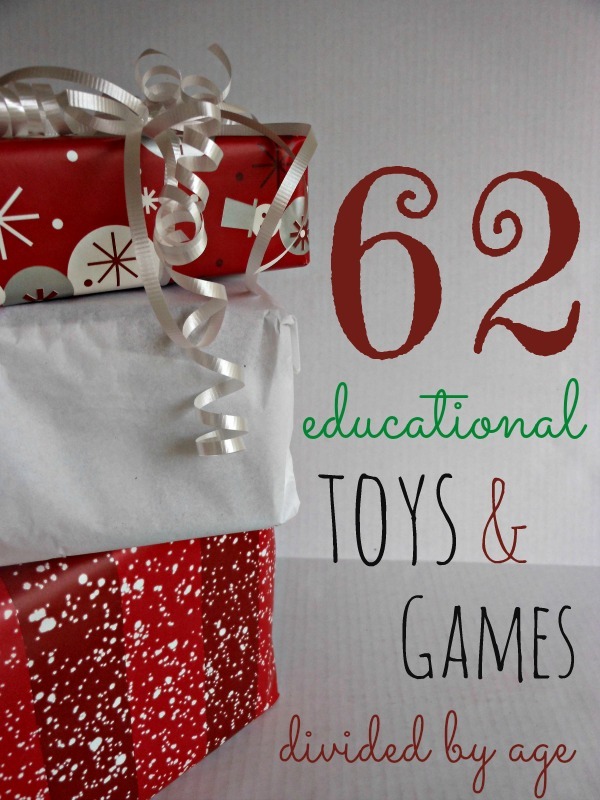 16 Educational Toys and Games for Kids Ages 6-10. 13 Educational Toys and Games for Kids Ages 10-14. If there is an educational toy or game that your family loves… add it in the comments! I’m an art teacher. My personal favorite for the older children is ZOMETOOL and I am honestly surprised that it is absent. I didn’t see magnets on the list. My 2 year old loves them. Spot It is a great card game. There are different sets, like a Jr edition, and there are 5 different ways to play with one set of cards. Not sure where you would like to post this gift idea but, I do believe it is worth mentioning. It’s for the entire family really – and great variety of options on Amazon – search for “Family Conversation Starter cards”! My teenagers loved them and they are a great way for the family to connect ! Such a great idea! Thank you, Kimberly.